Users choose among six different processor types for their favorite programming environment. 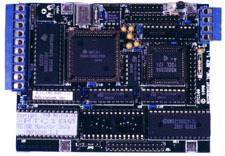 Then, if the processor board's considerable onboard I/O isn't enough, they choose from more than a dozen different I/O expansion boards to add on top of the processor boards. Whatever the application, whatever the voltage and I/O constraints, a Micromint RTC stack results in an unbeatable price-performance package every time. The RTC-AD12E is our newest addition to the RTC line. It is affered in 3 configurations, the EA, EB and ED versions. 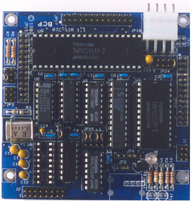 The EA version offers an 8-channel (4-channel differential) 12 bit analog-to-digital converter. 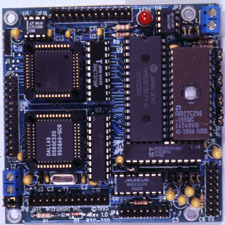 The EB version includes the 4-channel digital-to-analog converter for the RTC bus. The ED version offers only the DAC. Perfect for those applications that involve more meticulous data collection, this peripheral board is the culmination of high performance and compact packaging. The RTC-AD12E’s 12-bit-plus-sign A/D converter performs more than 20,000 conversions per second within an input range of -5V to+5V. The ADC incorporates special input overvoltage protection and input scaling which is especially useful for low-level signals or high-noise environments. Each channel is independently gain programmable for 1, 2, 4, or 8 times gain. The RTC-AD12E also has four buffered, fast-action DAC outputs. Each channel can have separate output scaling. 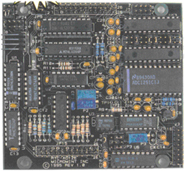 The RTC-BUF50 is a TTL-level digital input/output expansion board with 48 TTL-level I/O lines that are selected as six 8-bit I/O ports. These six ports may be configured as any combination of inputs and outputs. Two industry-standard 50-pin ribbon cable headers provide external connections to typical Opto-22-type expansion interface boards such as the IDI24 (optoisolated DC input) and IDO24 (contact-closure relay output). The RTC-BUFIO is a buffered, high-voltage, digital input/output expansion board designed to directly power external devices (such as relays and indicators) and protect digital inputs from real-world interfacing anomalies. RTC-BUFIO offers a total of 48 I/O lines: 24 high-voltage buffered input lines which easily withstand –30V to + 30V input voltages, and 24 digital driver output lines that provide as much as 1/2A driving current for lamps and relays. 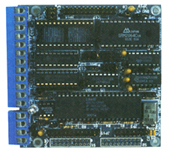 Six 2x10 ribbon cable headers are provided for external connections to the six 8-bit I/O ports. RTC-SIR is a multifunction expansion board offering a combination of four independent I/O subsystems: bidirectional TTL parallel I/O, RS-232 serial I/O, infrared transmit and receive, and 16-bit programmable timers. 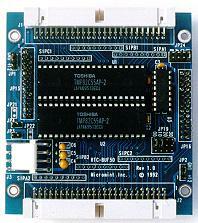 The parallel I/O consists of 24 bits of TTL from an 8255 PPI. The RS-232 serial I/O consists of an independent UART and timebase which provide all standard data rates from 50 to 38,400 bps. The onboard infrared transceiver consists of a 40-kHz modulated or digital on/off infrared transmitter and 40-kHz fixed-frequency receiver. Finally, for precision timing, the RTC-SIR is fitted with the 8254 programmable timer, giving it three independent 16-bit binary or BCD counter/timers.